Martin, Therese, ed., ‘Me fecit’. Making Medieval Art (History), special issue, Journal of Medieval History vol. 42, no. 1 (2016); “The Margin to Act: A Framework of Investigation for Women’s (and Men’s) Medieval Art-Making,” pp. 1-25. Award: Best Article 2015-2016, Society for Medieval Feminist Scholarship. Martin, Therese, “Crouching Crossbowmen in Early Twelfth-Century Sculpture: A Nasty, Brutish, and Short(-Lived) Iconography,” Gesta 54, no. 2 (2015), pp. 143-164. Award: Bishko Prize, Best Article 2015, Association for Spanish and Portuguese Historical Studies. Martin, Therese, “Contribuciones del mecenazgo multicultural a la autoridad de las élites femeninas en la península ibérica (ss. X-XI),” in Arquitectura y mujeres en la historia, ed. M.E. Díez Jorge, Madrid: Editorial Síntesis, 2015, pp. 115-144. 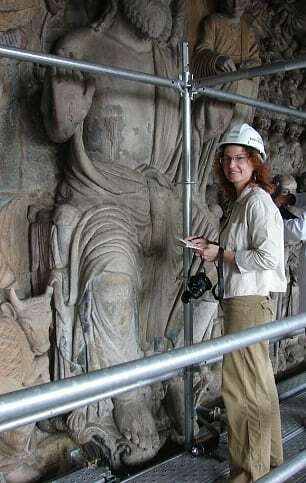 Jennifer S. Alexander and Therese Martin, “Sistemas constructivos en las fases iniciales de la Catedral de Santiago: una nueva mirada al edificio románico a través de las marcas de cantería,” in En el principio: Génesis de la catedral románica de Santiago de Compostela. Contexto, construcción y programa iconográfico, ed. J.L. Senra, Pontevedra: Teófilo, 2014, pp. 142-163. Martin, Therese, ed., Reassessing the Roles of Women as 'Makers' of Medieval Art and Architecture, 2 vols., Leiden, 2012; “Exceptions and Assumptions: Women in Medieval Art History,” pp. 1-33. Martin, Therese, "Vie et mort dans le Panthéon de San Isidoro de León," Les Cahiers de Saint-Michel de Cuxa 42 (2011), pp. 153 – 164. Martin, Therese, "Chronicling the Iberian Palace: Written Sources and the Meanings of Medieval Christian Rulers' Residences," Journal of Medieval Iberian Studies 2/1 (2010), pp. 109 – 139. Martin, Therese, "Recasting the Concept of the 'Pilgrimage Church': The Case of San Isidoro de León," La Corónica, A Journal of Medieval Spanish Language, Literature & Cultural Studies 36/2 (2008), pp. 165 – 189. Martin, Therese, Queen as King: Politics and Architectural Propaganda in Twelfth-Century Spain, Leiden, 2006. Martin, Therese, "The Art of a Reigning Queen as Dynastic Propaganda in Twelfth-Century Spain," Speculum 80 (2005), pp. 1134 – 1171. Martin, Therese and J. A. Harris, eds., Church, State, Vellum, and Stone: Essays on Medieval Spain in Honor of John Williams, Leiden, 2005. “The Medieval Treasury across Frontiers and Generations: The Kingdom of León-Castilla in the Context of Muslim-Christian Interchange, c. 1050-1200” (National Excellence in Research Grant, Spanish Ministry of Economy and Competitivity, HAR2015-68614-P), 2016-2018. “Reassessing the Roles of Women as ‘Makers’ of Medieval Art and Architecture” (1,200,000€, European Research Council Starting Grant no. 263036), 2010-2015. Agencia Nacional de Evaluación y Prospectiva (ANEP), Spain. Comisión Nacional de Investigación Científica y Tecnológica, Programa FONDECYT, Chile. Fund for Scientific Research-FNRS, Belgium. Social Sciences and Humanities Research Council, Canada.